Wiz is now fully compatible with the latest bbPress forum software version. Now you can easily setup discussion forums inside your WordPress powered site. Smart Skin will help you Save Hours spent in customizing theme?s colors to mach your brand?s color scheme. Not only the primary color will change but every single color on the theme. Smart Skin will magically apply your color scheme on 100+ elements with one click. It?s now easier for you to generate your own website color scheme with Smart Skin Generator. Just select 2 colors for your site and the generator will create an awesome custom monochromatic Smart Skin for your site with one click. Smart Skin Generator is the First Real Website Color Scheme Generator have ever built. Wiz fully supports WooCommerce plugin plus extra features like: Add to Wishlist and Add to Compare. Not only 1 but 9 Ready-made widget designs with unlimited customization possibilities like changing color, font awesome icon, top and bottom margins. Don?t Waste more time scrolling across hundreds of fonts to find the font you want! Fonts manager Improves your Site Speed and Saves your Time by allowing you to create a short list of Google and custom fonts you will Actually need to make it easy for you to use around the theme. Wiz is loaded with all you need to build awesome website. 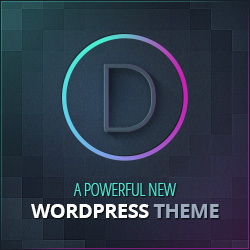 We don?t call it a theme as we developed it to be a Complete Template Framework which will meet all your needs. 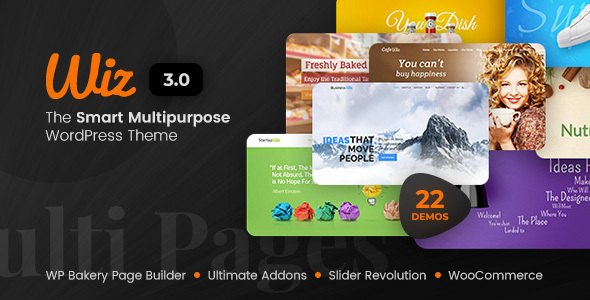 Create stunning layouts and pages on a snap with drag and drop page builder and enormous collection of Addons and shortcodes that will enrich your pages. 30+ Premium Features added to VC to enrich your layouts designs. 29+ Essential VC Features and elements ?Exclusively? available with Wiz Theme. LeapPanel allowing users to quickly and easily customize the theme without any coding knowledge. Change colors, fonts, choose from 8 different headers and layout in any way you want. With the superior flexibility of our LeapPanel, Wiz allows you to create unique websites for many purposes like business, portfolio, blog, magazine and more. Wiz includes 140 Shortcodes for creating great custom content with no effort. Also it includes a visual shortcode generator that allows you to add more shortcodes. Also we are committed to add more shortcodes regularly. Wiz includes over 672+ Google Fonts, standard fonts and you can upload custom fonts. In theme options you can change the font size, family, color, style, variant, weight, letter spacing, line height, text decoration and text transform. Wiz includes ready-to-use 8 header designs to choose from as well as a sticky header option and you can change it for each page/post. You can create unlimited portfolio pages with multiple layouts styles; Grid and 1 ? 4 columns with custom categories per portfolio page and awesome rollover effects. Wiz page/post meta options makes it easy to customize your content for each page/post. You can control sidebar position, related posts, author information, banners, headers, menu, widget positions and much more. Wiz Layout adapts to the any screen size of whatever device. You are free to enable/disable responsive mode from LeapPanel. All Wiz theme assets will look great on high pixel density devices like iPad, iPhone, Android Phones, Retina Mac Books etc. If you need even more customizations, you can easily add custom CSS directly from out theme options panel without editing core theme files.Those styles can apply for global, tablets, wide phones and phones. Those styles will overwrite the theme styles and will not be lost when upgrading the theme. Wiz includes a built in social counter widget which grabs the latest counts of your followers from FaceBook, Twitter, Youtube, Vimeo, Dribble, SoundCloud and Behance. Users can create an unlimited number of sidebars from the admin panel. This is perfect for creating custom sidebars with specific widgets to fit it perfectly on your pages! Wiz includes a built in banner management system. You can easily add image banners or codes on the header, above post or below post also you can override these banner per post and/or page. Most of shortcodes include CSS3 animations with various options like setting animation type, animation speed, animation delay, animation iteration and animation offset. It?s a great way to grab the viewers attention towards your content. Wiz includes a built in theme updater to make your life easier. There is no need to upload bew theme files via FTP or WP. Just set your Themeforest credentials from the LeapPanel and you will get a notification to update theme when a new update is released by just on click of a button. Includes a built in support for Facebook comments with a lot of options that you can set from the LeapPanel like comment box width, color scheme, language, number of comments and comments order. Wiz supports Google Analytics, Google webmaster tools, Bing and Alexa by adding their meta values directly from out theme options panel without editing core theme files nor installing another plugins. Wiz built with SEO best practices considered for your website to achieve higher ranking. can add title, description and keywords meta tags per post, page and for the entire website. Wiz uses valid HTML and CSS which allows search engines to easily index your content. Wiz is ready for translation to the language of your choice. In addition; it works perfectly fine with WPML Multilanguage Plugin in case you want to run multiple languages at once. Wiz includes a license for the amazing Revolution Slider WordPress plugin created by themepunch. $18 value included with the theme purchase. The most advanced Responsive WordPress Slider Plugin with the famous Parallax Effect and hundreds of transitions is included. Save $17 when you buy Wiz theme. Wiz supports one of the best FREE Contact Form Plugins so you can create and customize your own contact page. Theme UI kit PSD files is included to help you create website mock ups faster and easier. All theme demo content pages, posts, menus and site settings is available to help you create your website much faster and easier. The entire font awesome icons (519 icons) set is integrated into Wiz via shortcodes. Users can choose from 3 different sizes; Large, Medium and Small and use them with or without a circle. The icons are also integrated into our content box layouts, as well as other areas throughout the theme. We prepared a comprehensive yet easy to follow online documentation that covers all theme features, Beside a useful FAQ section. We will also add video tutorials soon. Please note: All images, videos and icons used in our demos are not included to the theme package. As some of premium plugins included are developed and updated by third party developers we cannot be 100% sure of consistency of their updates and quality so we may be obligated to add/remove/replace premium plugins included in Wiz theme in future theme updates because of quality/compatibility issues without prior notice. - Fixed Checkbox woocommerce page. - Added: New Travel Blog Demo. - Fixed: Widget double title. - Fixed: Default Excerpt not displayed in Blog Listing. - Fixed: Font family option doesn't work in shortcodes. - Fixed: Placeholder not displayed on Edge browser. - Added: Right/Left image blog style. - Added: Ability to change portfolio category and tag slugs. - Improved: Include Google maps API URL into contact template only. - Fixed: Search results displayed with shortcodes codes. - Improved: Disable smooth scroll effect if ultimate addon one is enabled. - Other improvements and minor bug fixes. - Fixed: Fatal error while importing demos. - Added: Boxed and wide options for header 8 & 9. - Added: Sticky menu logo upload option. - Added: New Smart Skin. - Improved: Automatically import Essential Grids. - Improved: Automatically import Layered Popups. - Improved: One Click Demo data importer. - Fixed TGM bug when installing bundled plugins.